MADFORWATER is a research and innovation project funded by the European Union’s Horizon 2020 programme and coordinated by the University of Bologna. Its full title is “DevelopMent AnD application of integrated technological and management solutions FOR wasteWATER treatment and efficient reuse in agriculture tailored to the needs of Mediterranean African Countries”. The general objective of MADFORWATER is to develop an integrated set of technological and management instruments for the enhancement of wastewater treatment, treated wastewater reuse for irrigation and water efficiency in agriculture, with the final aim to reduce water vulnerability in selected basins in Egypt, Morocco and Tunisia. A strong dialogue between the consortium and numerous MAC and international stakeholders involved in the Stakeholder Advisory Board, to maximize the suitability of the proposed solutions in relation to the local context, and therefore the expected long- term impact of the MADFORWATER technologies, water management strategies and policies. The MADFORWATER concept is based on a continuous and synergic interaction between four main domains: water supply, water demand, adaptation and integration. 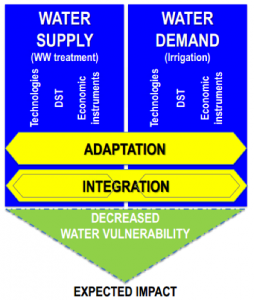 WATER SUPPLY and WATER DEMAND are the VERTICAL DOMAINS, or fields of action, consisting in the development of technological and non-technological solutions to reduce water vulnerability and the impact of water scarcity in agriculture by increasing the amount of available irrigation-quality water (SUPPLY) and reducing the amount of water consumed in agriculture (DEMAND). ADAPTATION and INTEGRATION are the HORIZONTAL DOMAINS, or transversal actions, through which the project valorises the “vertical” interventions, by ensuring that their outcomes will be technically and culturally suitable for the environmental and socio-economic context of the target countries (ADAPTATION). Furthermore, the outcomes are amplified and maximized through the integration of the technological solutions with economic and regulatory instruments within each vertical domain and through the combined application of the two vertical domain solutions (INTEGRATION). Through a comprehensive set of research and innovation actions, MADFORWATER will deliver new cutting edge solutions for a long term decrease of water vulnerability in the target MACs. The MADFORWATER activities are organized into eight work packages, whose main objectives and activities are summarized below. Analysis of water and water-related vulnerabilities in the target MACs at country level, integrated by a more in-depth qualitative and quantitative assessment in 3 selected basins. Lab-scale development and adaptation of technologies for municipal, agro-industrial and industrial wastewater treatment will be part of WP2 of the MADFORWATER activities. Eleven technologies will be adapted to local conditions, screened and assessed in terms of performances, LCA, costs & benefits and social acceptance in the target countries. Lab-scale development and adaptation of technologies for efficient water reuse in irrigation. Six technologies will be adapted to local conditions, screened and assessed in terms of performances, LCA, costs & benefits and social acceptance in the target countries. Selection and integration of the technologies to be scaled up and the sites for their pilot testing in WP4 of the MADFORWATER activities. Design, setting up, monitoring and optimization of 4 integrated field pilots of wastewater treatment and treated wastewater efficient reuse in agriculture. Review and assessment of the current use of economic instruments and policies in the field of water management in Egypt, Morocco and Tunisia; development of open access decision support tools (DSTs) that will include economic and regulatory instruments for the enhanced implementation of the MADFORWATER technologies; development of strategies for WW management, water reuse and water & land management in agriculture, tailored for the 3 selected basins. Establishment of policy recommendations to promote the adoption of the proposed technologies and integrated strategies in the target countries; development of guidelines aimed at enabling the adaptation and implementation of the MADFORWATER tools and technologies; development of business plans for the commercial exploitation in the target MACs as well as a more general industrial exploitation strategy targeted to the European water and irrigation industry. Developing and conducting dissemination, communication and exploitation measures focused on broadcasting the project’s potential, raising awareness amongst all stakeholders and ensuring post-project impact, including capacity building and creating stakeholder involvement. Management and coordination activities, including administrative and financial management and reporting.